Workflows allow you to automate tasks such as updating your organisation data and the generation and delivery of report bundles. You can manually start a workflow or have it automatically triggered at a scheduled time. The steps here will outline how to create a workflow in the desktop user interface. Click on Automation from the General toolbar. In the Automation screen click New. Add a name and description to your workflow in the Create New Automation box. Description: This is optional but may be useful for other users to understand the purpose and actions that will occur in this workflow. 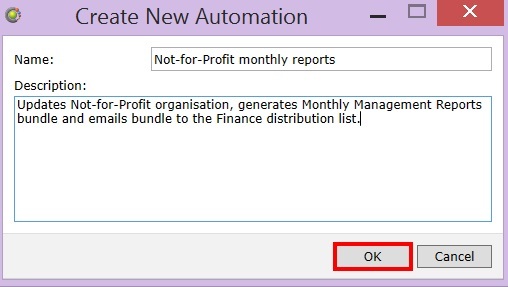 In this workflow example we will update the organisation, generate a report bundle and email it to a distribution list. Click on the Steps tab on the Workflow screen. Next click New and Organisation Update. Select the organisation you want to update from the Organisation drop down menu. Click the New button again and then select Report Generation. Next select the Report Bundle you’d like to run from the drop down menu. Finish by entering the email address of any users you’d like to receive the report bundle via email. User email addresses should be separated by a semi-colon (;). Click Save. Repeat from point 5 if you require additional steps in the workflow. In the Steps tab you can see your configured steps listed in the order they will be performed when this workflow is triggered. Each step title describes what action will be performed. To reorder the steps in a workflow click on the ellipse symbol, then select Move Up or Move Down from the drop down menu as needed. To delete steps in a workflow select Remove from the drop down. To remove steps from a workflow before you’ve saved it, click Cancel. To edit a workflow name or description click Properties. To delete a workflow select the workflow from Workflows on the left and click Delete. A workflow can be configured to run automatically on some trigger or you can run it manually. To run a workflow manually select the workflow and click Run. The status of running or completed workflows is displayed in the History tab. The status is either queued/running, succeeded or failed. To configure a workflow to run automatically click on the Triggers tab and click the New button. To configure a schedule, select the time and days and frequency you would like this workflow to run. In the example below the workflow will run each Monday at 5 am. 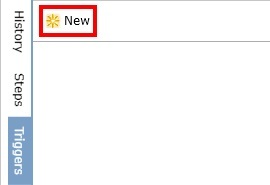 To add an additional trigger, click New. The schedule trigger is the only trigger currently supported. Additional conditional triggers are in development.